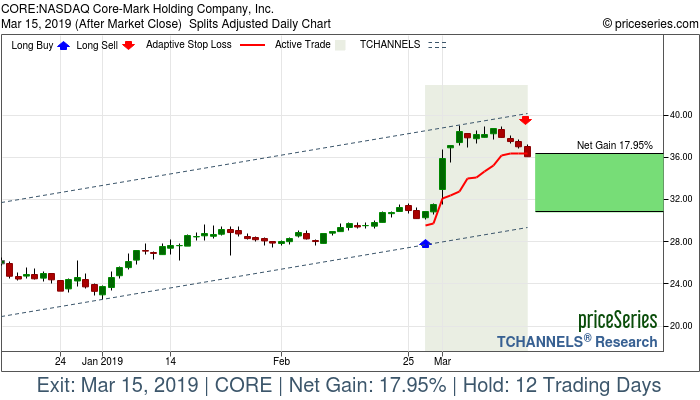 About Core-Mark Holding Company, Inc.
Core-Mark Holding Company, Inc. markets fresh and broad-line supply solutions to the convenience retail industry. The company sells and distributes various food/non-food products, including cigarettes, fast food, candies, snacks, groceries, fresh products, dairy products, breads, beverages, other tobacco products, general merchandise and equipment, and health and beauty care products. Its customers include traditional convenience stores, such as national and super-regional convenience store operators, as well as independently owned convenience stores; and alternative outlets, which include grocery stores, drug stores, liquor stores, cigarette and tobacco shops, hotel gift shops, military exchanges, college and corporate campuses, casinos, hardware stores, airport concessions, and other specialty and small format stores that carry convenience products. The company offers its products to 43,000 customer locations through a network of distribution centers in the United States and Canada. Core-Mark Holding Company, Inc. was founded in 1888 and is headquartered in South San Francisco, California.